Today I am back with Style Perspectives and The Blended Blog. Our host this week is Sheila from Making the Most of Every Day and our theme is what to wear to a graduation. Since I will not be attending a graduation ceremony, I decided to put a spin on the theme - and show a casual look I may wear to a graduation open house and party. I also picked up this Louis Vuitton look-alike bag during a price matching sale at Nordstrom. It was marked down $100 - so I decided to get it. Be sure to share you graduation look - and join our LINK UP. White on white terrifies me, but I do try it sometimes, but you own it! You look great, and I just might buy those shoes. Really like this look, I need to bust my white pants out ASAP! Love the white on white with the denim jacket- I was toying with this look yesterday and couldn't find a perfect pairing. I will have to try this! Perfect for graduation open houses and parties! If it's chilly enough of my sons open house, I'm totally wearing a Jean jacket over my sundress!! Love the white jeans, they're great! Classic styling! White jeans are the best! Cute look! Great look for a casual graduation party! I'm having such a hard time finding white jeans that I like! I have a pair but I get irritated with them every time I wear them because they just don't fit well. I wish I could afford the pair you linked to! 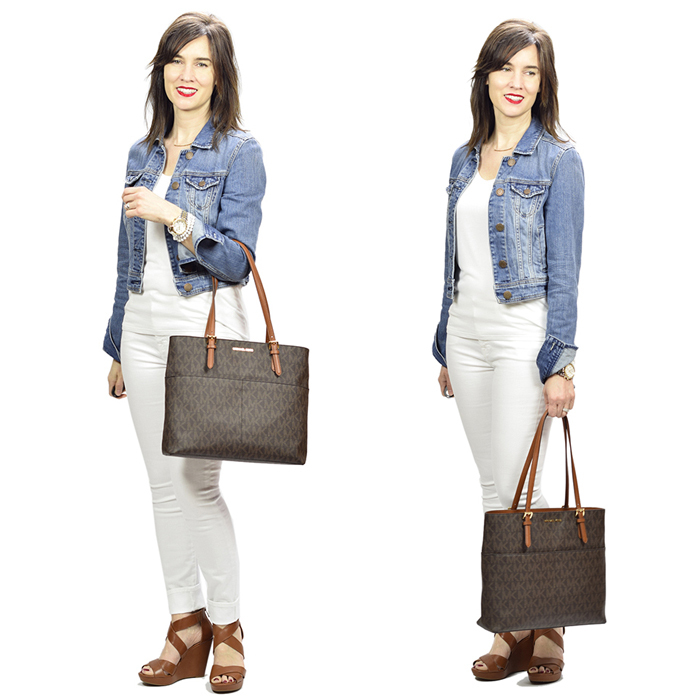 White denim is a summer favorite of mine. Loving those shoes! So glad you found a pair of white jeans you like. It's quite a feat. You styled them so well! Love this look for a graduation party! So pretty! I love a good white on white outfit! Love how you broke it up with the accessories! Looking good - very spring and cool summer nights appropriate! I hear you on finding the perfect white jeans - it's so difficult. These are wonderful! They fit you so well. Good choice, Lisa! Simply chic. The white on white seems dressy to me and the denim just makes it more fun. Love that you added a denim jacket to the all white look, so fun! I'm so glad you found your white jeans you've been looking for! They do look great on you! I love the dressy/casual look of all white with the denim jacket. Yay for finding white jeans! Love the white on white look. I love white denim, especially this time of year. And jean jackets are pretty much my favorite, so I love this look! Really fantastic look! I love the all white with cognac and blue denim. 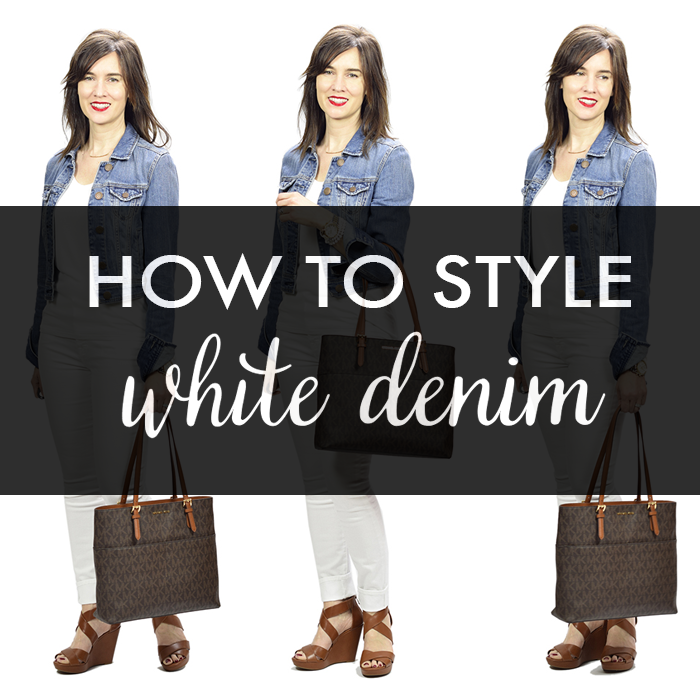 Over the past few weeks I have found myself reaching for my white jeans constantly because they are so versatile. 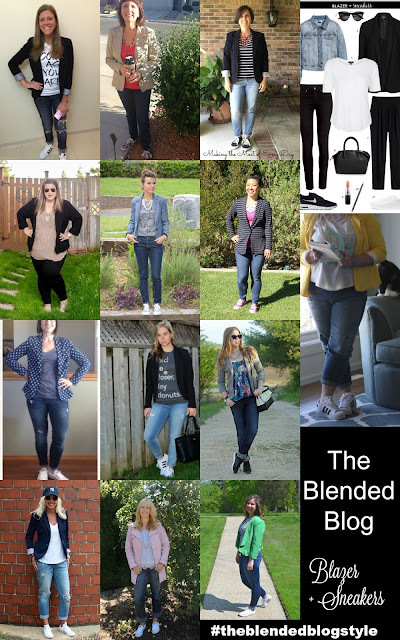 Thanks for linking up with The Ageless Style link-up, Lisa!